YOU ARE MY BELOVED SON, WITH YOU I AM WELL PLEASED. Today's celebration of the Baptism of the Lord marks the conclusion of the miracle of Christmas. God entered humanity at Jesus' birth and now again, God enters into humanity in his baptism. 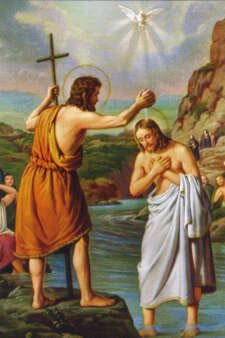 Jesus stood in line with sinners to be baptized by John. "For our sake he made him to be sin who did not know sin, so that we might become the righteousness of God in him." (1 cor 5:21). In our first reading (Isaiah 42:1-4, 6-7), we hear the first of four "servant songs of Isaiah". Four peoms seen by the early Church and ever since to refer to the Christ. In this first poem, it is God's selection of the Servant who would be a "covenant of the people, a light for the nations." In our Gospel reading (Luke 3:15-16, 21-22), we hear of the baptism of Jesus, what happened before and what happened after. John proclaims "one mightier than I is coming". After Jesus is baptized and praying, the Father and the Spirit make known their participation in this event. From this point on, Jesus will baptize with the "Holy Spirit and fire", preaching, teaching and healing. The people were filled with expectation, and all were asking in their hearts whether John might be the Christ. John answered them all, saying, "I am baptizing you with water, but one mightier than I is coming. I am not worthy to loosen the thongs of his sandals. He will baptize you with the Holy Spirit and fire." In our Epistle reading (Acts 10:34-38), we hear an excerpt of a speech given by St. Peter to a Gentile Centurian, Cornelius, as he was about to baptize him. Peter tells how Jesus, from his baptism by John, was anointed by the Holy Spirit and went about doing good and healing. This baptism is now open to all peoples. Peter proceeded to speak to those gathered in the house of Cornelius, saying: "In truth, I see that God shows no partiality. Rather, in every nation whoever fears him and acts uprightly is acceptable to him. You know the word that he sent to the Israelites as he proclaimed peace through Jesus Christ, who is Lord of all, what has happened all over Judea, beginning in Galilee after the baptism that John preached, how God anointed Jesus of Nazareth with the Holy Spirit and power. He went about doing good and healing all those oppressed by the devil, for God was with him." In our readings today, we are reminded that Baptism is the gateway to life in the Spirit. We are reminded of our own baptism - our own anointing by the Holy Spirit as priest, prophet and king. We are called to follow in the footsteps of Jesus, "doing good and healing all those oppressed by the devil." This is a mission we would have no ability to do except by the grace of the Holy Spirit.